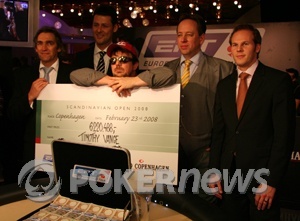 Congratulations to the 2008 EPT Copenhagen Champion, Tim Vance! After a nearly five-hour heads-up battle, Tim Vance was finally able to whittle down Soren Jensen and come away with his first major poker title. In addition to winning over $1.2 million USD for his victory, Vance also earns a seat in the EPT Grand Final in Monte Carlo, which kicks off on April 11. "Yes! Yes! I did it, Nanzi!" cried Vance, as he looked lovingly at the photo of his three-year-old daughter that has been taped inside his red baseball hat for the duration of the tournament. Runner-up Jensen was naturally disappointed and had hardly a word to say in his post-tournament interviews, while an emotional and exhausted Vance could only think of his daughter, crying "Nanzi!" as he hoisted his trophy aloft. Congratulations to Tim Vance, a player we'll certainly be hearing from again at future EPT events. Limped pot. Flop comes . Turn is the . Soren bets 115,000, Tim quickly calls. River is the . Soren moves all in. Tim calls with after announcing, "It was nice playing with you sir," and it is all over. Tim Vance is the EPT Copehagen champion, winning $1,236,095. Soren Jensen is the runner-up and wins $699,724 for his efforts. 1. Tim gets a walk. 2. Limped. Flop is . Tim bets and wins. 3. Soren moves all in and Tim folds. Both players limp to a flop...and check it. The turn is the and both check again. The river is the . Jensen checks, Vance bets 200,000 and Jensen calls. Vance shows J-8 for two pair and takes it down. Now it's 3.6 million for Vance to Jensen's 1,000,000. Tim has chipped his way back up to almost a 2-to-1 lead. Jensen calls on the button and Vance checks. The flop is . Jensen bets 130,000, Vance announces "all in" and Jensen folds. Vance limps on the button and Jensen checks. The flop is and both players check. The turn is the . Check-check. The river is the . 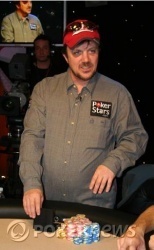 Jensen checks, Vance bets 200,000 and Jensen folds. The casino closes at 4am and John Duthie, the EPT founder, is worried now that this will not be finished by then.